Puppies born March 30, 2019. 1 boy available!! 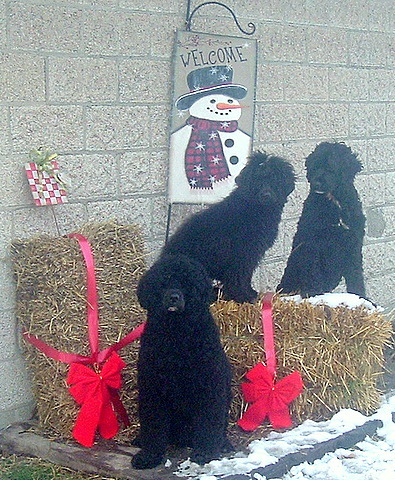 Breeding home raised, family friendly Portuguese Water Dogs. We live on a big country acreage in a small town in Eastern Ontario. We have pets that live in our house, go walking off leash in the forest with us and our horses, skis, ATV's, snowmobiles or however else we are out. They run and play outside and then come in and relax with us in the house. They live with us, a regular family, 2 kids and a cat. Having owned a spaniel who was gorgeous but very ill tempered, having owned a Rottweiller who was my pride and joy, trained to very high levels but could never be fully trusted, I had my own ideas about what I wanted to do with my own breeding program. After heartbreak with my Rottweiller, I was looking for a new breed. I love the Working class of dogs because I feel that they are very well balanced in house and work. They play and are active when it's time but settle down when the activity is low. I met a gentleman who mentioned Portuguese Water Dogs. At the time, slightly embarrassed I must admit, because I was already involved in dogs professionally, I didn't know the breed! So I started researching! I fell in love! Great size, great mind, Working dog. Non-shedding was a bonus at the time (which now - I'm not sure I could go back to a shedding dog!). I had no allergies but it sure is nice to be able to share my dogs with people who generally can't be around dogs - they are always so happy to pet a dog that doesn't give them a reaction. I made connections in our area and through Fate, I got my 'Tiago'. My pride and joy. He was my main man and I never looked back. 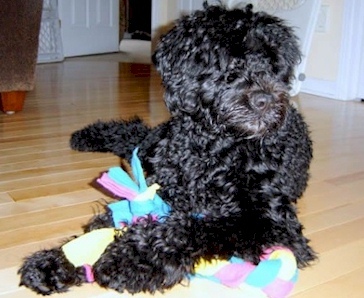 He and the Matriarch 'Grace' started the wave of MorFrends Portuguese Water Dogs. I have been professionally invovled with dogs since 2000. Boarding, Training, Instructing classes, Teaching others to be trainers, Temperament Testing, Competing in a multitude of dog sports, Instructing workshops across Canada on Canine Behaviour among other canine activities. I have hosted several workshops, clinics and classes specifically geared to PWD's. 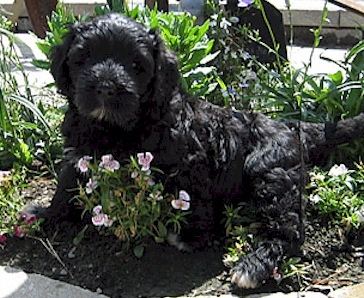 I've owned several breeds of dogs over the years such as Maltese, Yellow Labrador, Cocker Spaniel, Chow Chow and Rottweiler before Portuguese Water dogs which I have now owned exclusively since 2004. 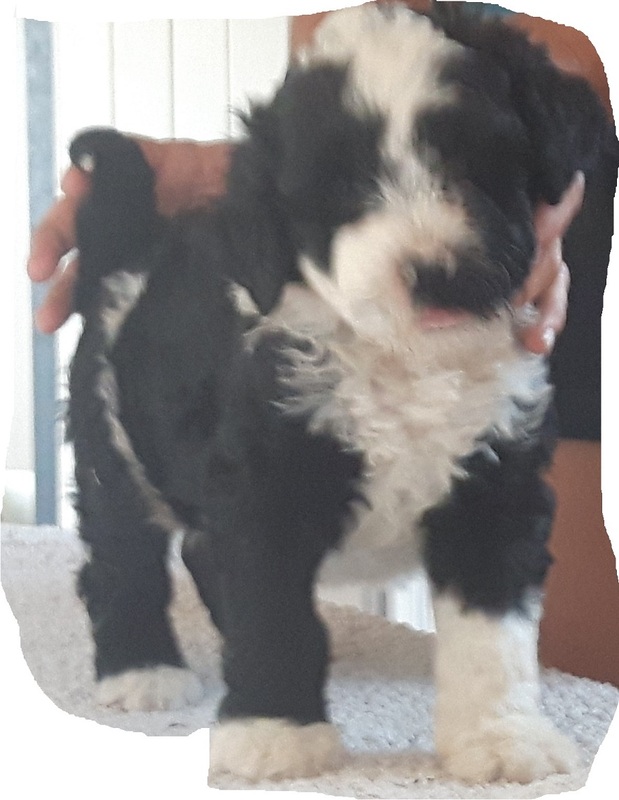 After falling in love with my own first two Portuguese Water Dogs, and learning more about breeding and conformation, I decided that I would like to begin my own breeding program, really wanting people to have dogs that were well tempered, loyal, friendly and adaptable. I never really concentrated on coat type or markings. I didn't believe the that the cutest dog was the best dog. I kept the dogs that I felt would pass on the best character. Since that time, we have owned, bred and loved many more PWD's ♥ See Our Dogs for more info. 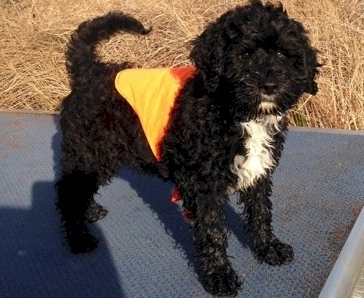 Interested in a Portuguese Water Dog? would love to find out more about you.